Пакет утилит сокрытия и шифрования данных. Steganos Security Suite - Premium security to ensure your privacy. Includes market-leading encryption, AntiSpyware and AntiTheft protection. 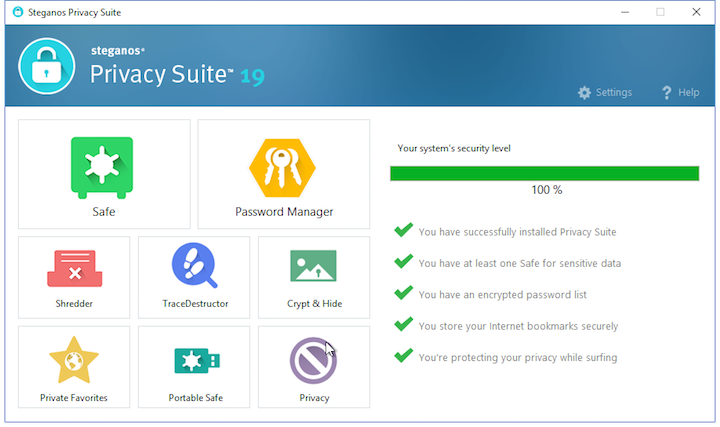 Steganos Security Suite combines ten powerful tools for protecting your privacy: Steganos Safe protects your sensitive data - it serves as your encrypted hard disk. You open the safe with a password, USB stick or your ActiveSync-capable SmartPhone: via Bluetooth or even wireless. Steganos Security Suite's excellent collection of heavy-duty encryption and Internet cleanup tools is best suited to small business and corporations. Includes solid encryption algorithms; lets you store sensitive files easily and safely; shreds private documents and removes all traces of Web activity. This encryption software enables users to securely store data and hide it from public view. It also allows them to send encrypted e-mails that require a password for the recipient to open it. Private data can also be hidden behind a picture or sound file. The software's Portable Safe enables users to encrypt data onto a CD or DVD, and then decrypt it on any other PC or laptop. Additionally, Steganos Security Suite 8 helps users manage their vast number of passwords and pin numbers and eliminate ones that might easily be found out. Finally, it deletes traces of PC and Internet usage and eliminates unwanted remnants of data from the hard drive. Кроме того в Steganos Security Suite включена утилита Удаления следов серфинга, задачей которой является "заметание следов" пребывания в Интернете (чистка Кэша, Журнала, cookies) и автономной работы (чистка списков недавно открытых документов, использованных программ, поиска и т.д. ).